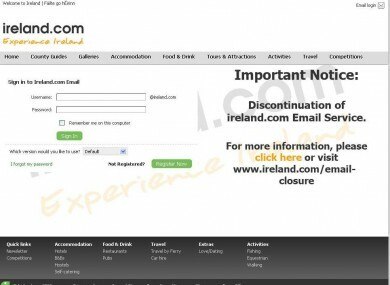 TOURISM IRELAND HAS said that it will not be providing an email service for users of the @ireland.com domain who will see their accounts shutdown within weeks after the Irish Times sold the domain for around €495,000. Some @ireland.com email users have responded angrily to yesterday’s news that their email service will be discontinued from 7 November when users will no longer be able to send or receive messages while emails sent to their @ireland.com address will bounce back. The 15,000 people who still use @ireland.com accounts will have until 7 December to transfer any data saved on their account to a new email host but some, who have been using the service for over a decade and initially paid for it, have expressed their unhappiness with the move. The Irish Times has said that the service was losing money and has apologised for the inconvenience the move will cause. Businesswoman Siobhan King-Hughes told TheJournal.ie: ”I’ve had this account for more than 10 years. Now I get three weeks notice that my email address is gone. No opportunity to protest, no reasonable time frame for change. Tourism Ireland, which is mostly funded by the State, acquired the domain in a deal worth around €495,000 which was announced yesterday. Not only will I now have to go through the tortuous process of having to inform everyone of a change of email address, but I will also need to get all my corporate literature, business cards, brochures, etc. revised, which will be a very expensive exercise and a cost I could do without in the current economic climate. Tourism Ireland said that it had acquired the domain “because the ease of recognition and memorability” of the domain. It said that the responsibility for the email address service lay with the Irish Times. The Irish Times did not immediately respond to a request for comment but its Head of Online, John O’Shea, told Siliconrepublic.com that that the email service “was no longer our core business” and had been outsourced to a third party. He said that the outsourcing of the service was costly and was losing the newspaper money as a result. Email “@ireland.com email users slam 'disgraceful' decision to end service ”. Feedback on “@ireland.com email users slam 'disgraceful' decision to end service ”.